The William H. Lincoln School, located near Rt. 9 on Kennard Road, serves a diverse population of 565 students in grades Kindergarten through 8. By providing students with supports and challenges, it is our goal to prepare all students for success in high school and beyond. 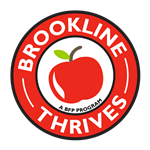 New at Lincoln this school year, Brookline Thrives is a free weekend food program available to any family who could benefit from additional food options for their child during the weekends. Brookline Thrives is a program of the Brookline Food Pantry and works in partnership with the Public Schools of Brookline. Brookline Thrives is operating only at the Lincoln School for the 2018/2019 school year, but plans to expand in all interested Brookline K-8 schools and High School in subsequent years. Families interested in participating in Brookline Thrives or to learn more can visit http://www.brooklinefoodpantry.org/brookline-thrives.html or email brooklinethrives@gmail.com.